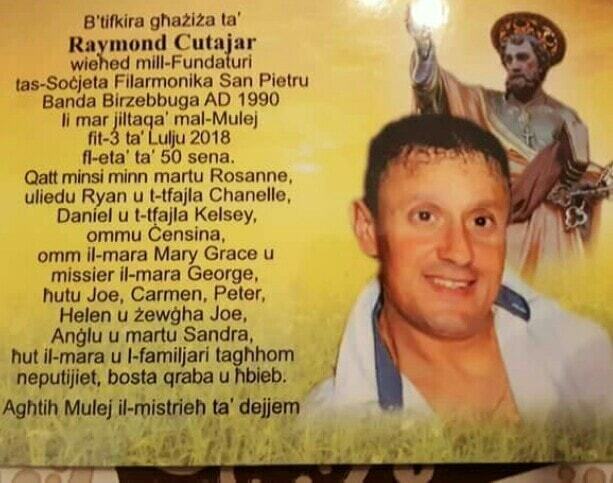 The funeral was held today of Raymond Cutajar at the St Peter’s Church in Birżebbuġa. Cutajar, known in Birżebbuġa as l-Mundu, had been fighting the cancer disease for the past six years. He was considered as a positive person, despite that in recent months Raymond was diagnosed with small traces of cancer and used to make weekly visits at the oncology hospital. Cutajar had told TVM that he will continue to fight the disease until he can continue breathing, remain active and live the full life.